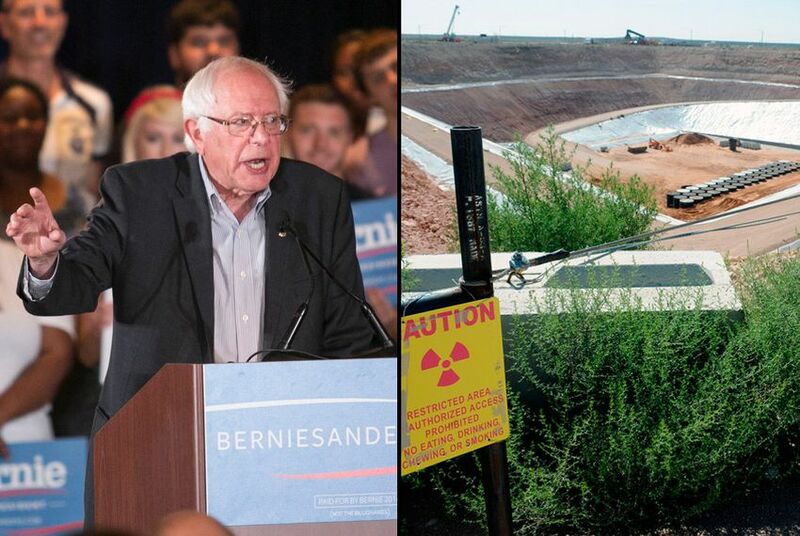 A Bernie Sanders-supported proposal from the late 1990s to dump Vermont nuclear waste in a small minority in West Texas has attracted renewed attention in the lead-up to Tuesday's primary. * This story has been updated to include a comment from Sanders' campaign. In the late 1990s, when now-U.S. Sen. Bernie Sanders of Vermont was a member of the House, he supported a compact between Maine, Vermont and Texas that originally proposed dumping low-level radioactive waste in a small minority community in far-West Texas, putting him at odds with other progressive congressmen. Though the waste never made it to Sierra Blanca, a low-income, largely Hispanic town in Hudspeth County, Sanders’ efforts have attracted renewed attention online in the lead-up to Tuesday's Texas primary. Critics suggest that the candidate’s role in promoting the compact — which ultimately brought the waste to a different site in West Texas — undermines his otherwise progressive record. But other activists in the area have forgiven Sanders for his role in the proposal. Bill Addington lives in Sierra Blanca and was a leading activist against the nuclear waste compact, creating a legal defense fund and even travelling to Vermont to directly protest Sanders. But now Addington says he is supporting Sanders in the Democratic presidential primary. Today, Texas is home to one of the nation’s few facilities that accept low-level nuclear waste. Since 2012, Waste Control Specialists in Andrews County has disposed of contaminated tools, building materials and protective clothing, among other items, from shuttered reactors and hospitals. Environmentalists have closely scrutinized the site as it has broadened the scale of the waste it accepts, but the company insists that it is safe. The site has seen minor spills and leaks, according to federal regulators, but those had been localized and properly cleaned up. Years before that waste arrived in Andrews County, it appeared destined for Sierra Blanca (population roughly 500), which sits about 90 miles southeast of El Paso. In 1998, the U.S. House — with Sanders’ support — approved the three-state compact, which then-President Bill Clinton signed into law, that paid wide-open Texas to take waste from the northeast. And years before, a Texas agency created to find a spot for such a facility chose Sierra Blanca, triggering environmental worries. After Congress approved the compact, Texas environmental regulators rejected the Sierra Blanca proposal. The Andrews County site gained approval years later. CNN’s Jake Tapper asked Sanders’ senior adviser Tad Devine on Tuesday about the controversy, noting that Clinton allies question how it squares with Sanders’ reputation for standing up for the disenfranchised. Devine also pointed to Sanders’ opposition to fracking as evidence of his “extremely strong record on the environment.” Despite the Sierra Blanca episode, Sanders has attracted endorsements from many prominent environmentalists who praise his efforts to phase out nuclear power among other positions. But when Devine served as a senior adviser on John Kerry’s 2004 presidential campaign, his candidate criticized both Howard Dean and George W. Bush for their support of the compact. “He clearly reflected an insensitivity to that community,” Kerry said of Dean. Bullard argued that it is “absolutely fair game” to resurface the criticism of Sanders’ stance on the long-settled issue during election season, describing it as part of the vetting process. According to a Texas Observer article from the time — provocatively headlined, "Sanders to Sierra Blanca: 'Drop Dead!'" —when activist Gary Oliver and others confronted Sanders to ask if he would at least visit Sierra Blanca, the representative offered a terse response. But now, much like Addington, Oliver is voting for Sanders in the Democratic presidential primary, even though he said he is still angry over the Vermont senator’s response to his protests. Among the most ardent political opponents to the plan were the late progressive U.S. Sens. Paul Wellstone of Minnesota and Ted Kennedy of Massachusetts. Wellstone, describing the intention to use Sierra Blanca as a site “blatant environmental racism,” proposed amendments to the bill that would allow the town’s residents to sue if discrimination influenced the decision to locate the facility there. Sanders supported passage without that amendment. Sanders' campaign manager Jeff Weaver said in a statement that the lack of safe options for disposing of nuclear waste is one of the reasons why Sanders has called for a moratorium on nuclear power. He also noted that the legislation before Congress did not specifically designate Sierra Blanca as the location for the nuclear waste dump. "We were assured that regulators would not pick a site that would be harmful to the environment or local communities in Texas," Weaver said. "That’s exactly what happened. The good news is that the Sierra Blanca site was rejected and none of this nuclear waste was ever sent there. That was the right decision to make. There is no question that there was a real environmental justice aspect to the Sierra Blanca site." Sanders maintains a connection to the nuclear waste agreement: Jane Sanders, the Vermont senator’s wife, now serves as an alternate commissioner for the Texas Low-Level Radioactive Waste Disposal Compact Commission. "Everyone considers Sen. Sanders to be a progressive, so we did hold him accountable,” Addington said. “But Bernie was not alone, so why are they singling him out?" But Bullard argues that nobody should get a pass for it.